Today we spent a few hours saving some bees. 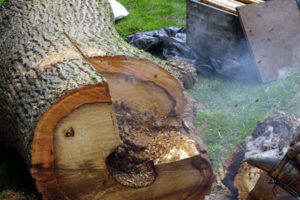 A bee friendly home owner was having a dying Ash tree removed and wanted to save the bee colony, which had made a cavity some 20 foot up its trunk, home. 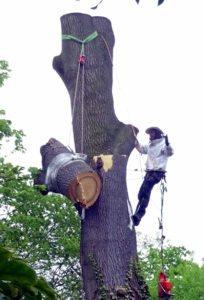 The day involved 2 tree surgeons, 2 beekeepers, 2 home owners, 2 dogs and lots of tea. It all started with a cold morning, smoke, rags to block the holes in the trunk and some clingfilm to block all exits. 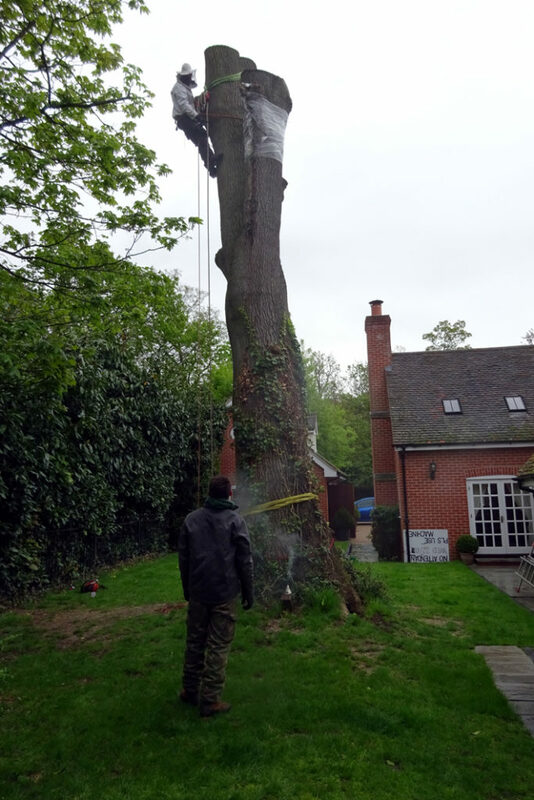 Next the 1/2 tonne trunk was cut off with a chainsaw and lowered to the ground. With the bees apparently unworried by the whole process, we decided it was time for a second cup of tea. A couple of very careful cuts later and we had access to the colony. We had initially thought the colony had made its home down the centre of the dying trunk, but it became clear that they had made their home in a medicine ball sized cavity, which looked like it had been a woodpecker nest. Finally came the easiest part. 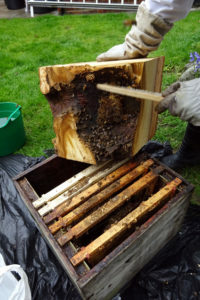 The pieces of comb came away quite easily, all well filled with brood, larvae and eggs. The last of the bees were brushed carefully into the hive and we were done. An hour later and the hive was installed in our apiary to settle down after the excitement of the day. 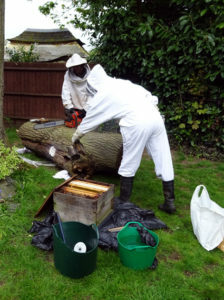 Whilst the weather, cold and drizzly, was perfect for moving bees, we were quite amazed just how docile they were. 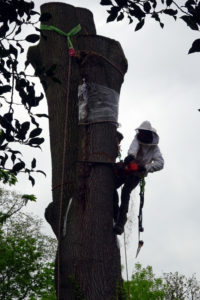 Having been subjected to the noise and vibration of a chainsaw, swung from a rope at 20 foot up, and then pulled around, they barely needed the smoke, they just sat there good as gold and let us move them around. 3 hours after we started, the job was done and the rain came down. 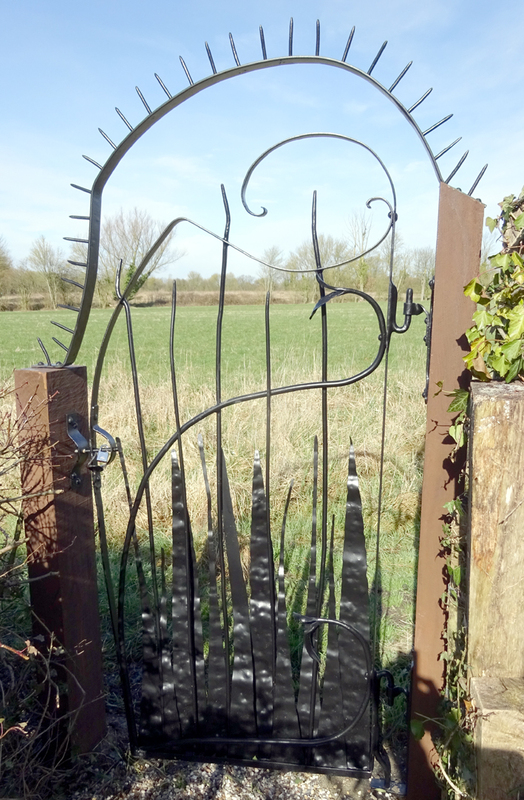 At last I have finished and installed my blacksmith gate. I wanted to give it some strength and bulk in the posts, so have used 20cm by 10cm oak sleepers. It has taken me a while to get it all finished, and of course the weather hasn’t helped, but here it is.